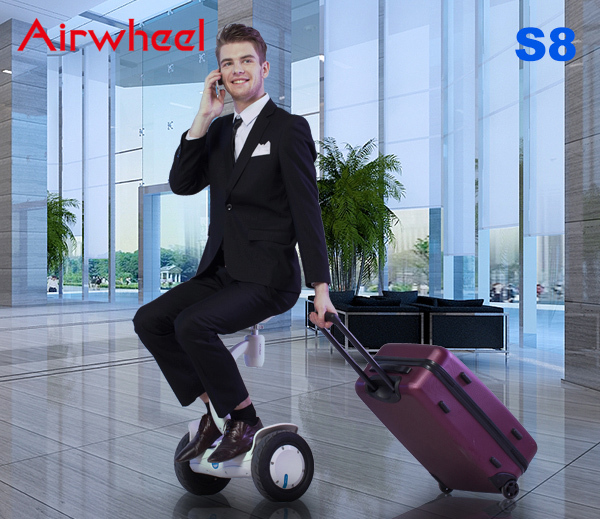 12, August 2016: Airwheel has completed the integration of portable transportation industrial chain, and the globalization of our brand name. Our smart scooters and skateboards have served over 30 million customers in 168 countries. Today, the attention is paid to the Airwheel S8 self-balancing electric scooter with dual ride mode. In 2001, Segway officially disclosed the first prototype of self-balancing scooter. Since then, there are several kinds of self-balancing electric scooters in the market with the features of high efficiency and zero release. But according to the relevant statistics, we find that the number of those who regard the self-balancing scooter as a sport or entertainment is greater than those who take it as daily commuting tool. It means that the self-balancing scooter is hard to be as popular as bikes, motorcycle, automobile and other popular traditional travel mode. So why, such excellent products are not accepted by the public? In the later investigation and research, we realize that difficult to learn is an important reason to hinder it from being popularized. Airwheel S8 self-balancing scooter rewrites the algorithm and upgrades the pressure sensitive system from two-shaft driving to all-round three-shaft driving, to achieve the purpose of either standing or sitting to ride. Riding becomes easier and safer with sitting posture. In sitting posture, people are more likely to feel safe with a low center of gravity. It is easier to make their body relaxed and easier to learn. When they sit to ride it well, they can try to stand to ride. Just like a baby learn to stand and walk. Step by step. This is also the specialty of S8 electric scooter with seat, as the traditional self-balancing electric scooter cannot provide riders with such experience. The two operating modes both leave the two hands free. Skillful riders can do other things with two empty hands, such as holding packages or carrying handbags. Airwheel S8 adopts the Cassinian curve design concept, which appears sportive and robust. S8 double-wheels electric scooter is loaded with imported li-ion battery, which has six-fold defenses including over-discharge protection, overcharge protection, short circuit protection, overcurrent protection, temperature protection and battery equalization. The re-upgraded APP is building a community for riders to share the joy of riding.